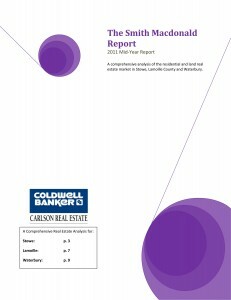 It is our pleasure to inform you that Smith Macdonald Real Estate Group has released its Mid-Year 2011 Report, our survey of residential real estate sales in Stowe, Lamoille County and Waterbury. This report compares data based on deals that closed in Q1 & Q2 2011 (January 1 through June 30) with those closed in the prior quarter and in the 1st half of 2010. The momentum generated by the Stowe area real estate market last year continued into 2011. Market-wide, first half of 2011 sales transactions increased 23% versus a year ago. This continues the positive market direction from the bottom in 2009. The Smith Macdonald Group of Coldwell Banker Carlson Real Estate represented 25% of all Stowe residential sales transactions during the first half of 2011. We are finding strong activity stretching beyond the lower price points. There continues to be a need for sellers to find ways to meet buyers on their terms, but when they do transactions are moving ahead quickly and sellers are finding qualified buyers for their homes. As always, we continue to follow closely this area's sales activity and trends in residential and land real estate, and would welcome the opportunity to answer any questions you may have about the report or the market generally. Request a copy of the report!